I protest against every order with which some authority may feel pleased on the basis of some alleged necessity to over-rule my free will. Laws: We know what they are, and what they are worth! They are spider webs for the rich and mighty, steel chains for the poor and weak, fishing nets in the hands of government. 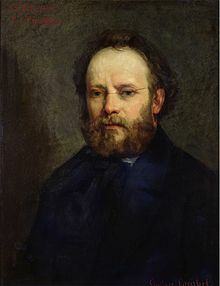 Pierre-Joseph Proudhon (pronounced [ˈpruːd.ɒn] in BrE, [pʁu.dɔ̃] in French) (15 January 1809 – 19 January 1865) was the first individual to call himself an "anarchist," and the first documented as using the word "Capitalist" to mean property-owner. La République est l'organisation par laquelle toutes les opinions, toutes les activités demeurant libres, le Peuple, par la divergence même des opinions et des volontés, pense et agit comme un seul homme. Dans la République, tout citoyen, en faisant ce qu'il veut et rien que ce qu'il veut, participe directement à la législation et au gouvernement, comme il participe à la production et à la circulation de la richesse. Là tout citoyen est roi ; car il a la plénitude du pouvoir, il règne et gouverne. La République est une anarchie positive. Ce n'est ni la liberté soumise A l'ordre comme dans la monarchie constitutionnelle, ni la liberté emprisonnée DANs l'ordre, comme l'entend le Gouvernement provisoire. C'est la liberté délivrée de toutes ses entraves, la superstition, le préjugé, le sophisme, l'agiotage, l'autorité; c'est la liberté réciproque, et non pas la liberté qui se limite; la liberté non pas fille de l'ordre, mais MÈRE de l'ordre. The Republic is the organization by which, all opinions and all activities remaining free, the People, by the very divergence of opinions and of wills, thinks and acts as a single man. In the Republic every citizen, in doing what he wishes and nothing but what he wishes, participates directly in legislation and government, just as he participates in the production and circulation of wealth. There every citizen is king; for he has plenary power, he reigns and governs. The Republic is a positive anarchy. It is neither liberty subjected to order, as in the constitutional monarchy, nor liberty imprisoned in order, as the provisional government would have it. It is liberty delivered from all its hobbles, superstition, prejudice, sophism, speculation, authority; it is mutual liberty, not self-limiting liberty; liberty, not the daughter but the MOTHER of order. The Republic is the organization by which, all opinions and all activities remaining free, the People, by the very divergence of opinions and will, think and act as a single man. In the Republic, every citizen, by doing what they want and nothing but what they want, participates directly in the legislation and in the government, as they participate in the production and circulation of wealth. There, every citizen is king; for he has the fullness of power; he reigns and governs. The Republic is a positive anarchy. It is neither liberty subjected to order, as in the constitutional monarchy, nor liberty imprisoned in order, as the Provisional Government intends. It is liberty delivered from all its shackles: superstition, prejudice, sophistry, stock-jobbing, authority. It is reciprocal liberty, and not the liberty which restricts; liberty, not the daughter of order, but the MOTHER of order. To name a thing is easy: the difficulty is to discern it before its appearance. 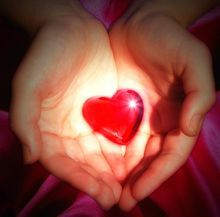 All men in their hearts, I say, bear witness to these truths; they need only to be made to understand it. Ch. I: "Method Pursued in this Work. The Idea of a Revolution"
Property is robbery! That is the war-cry of '93! That is the signal of revolutions! Reader, calm yourself: I am no agent of discord, no firebrand of sedition. I anticipate history by a few days; I disclose a truth whose development we may try in vain to arrest; I write the preamble of our future constitution. This proposition which seems to you blasphemous — property is robbery — would, if our prejudices allowed us to consider it, be recognized as the lightning-rod to shield us from the coming thunderbolt; but too many interests stand in the way! … Alas! philosophy will not change the course of events: destiny will fulfill itself regardless of prophecy. Besides, must not justice be done and our education be finished? Property is theft! is a more famous translation of the original: La propriété, c'est le vol! I have made every effort to obtain exact information, comparing doctrines, replying to objections, continually constructing equations and reductions from arguments, and weighing thousands of syllogisms in the scales of the most rigorous logic. In this laborious work, I have collected many interesting facts which I shall share with my friends and the public as soon as I have leisure. But I must say that I recognized at once that we had never understood the meaning of these words, so common and yet so sacred: Justice, equity, liberty; that concerning each of these principles our ideas have been utterly obscure; and, in fact, that this ignorance was the sole cause, both of the poverty that devours us, and of all the calamities that have ever afflicted the human race. Ch. III: "Labor as the Efficient Cause of the Domain of Property"
Ch. IV: "That Property Is Impossible"
The elements of justice are identical with those of algebra. AXIOM. — Property is the Right of Increase claimed by the Proprietor over any thing which he has stamped as his own. Ch. 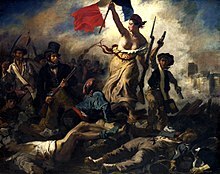 V, Part 2; this might be the ultimate inspiration of the later slogan coined in 1848 by Anselme Bellegarrigue (and often attributed to Proudhon): "Anarchy is order, government is civil war." I will explain … how, studying in the silence of my heart, and far from every human consideration, the mystery of social revolutions, God, the great unknown, has become for me an hypothesis, — I mean a necessary dialectical tool. It is necessary to have lived in this insulator which is called the national assembly, in order to perceive how the men who are the most completely ignorant of the state of the country are almost always the ones who represent it. As translated in "P. J. Proudhon in the Revolution of 1848" by Mary B. Allen The Journal of Modern History (1952) 24:1-14. It is necessary to have lived in this insulator which is called the national assembly, in order to perceive how the men who are the most completely ignorant of the state of the country are almost always the ones who represent it. I set myself to read everything that the distribution bureau sends the representatives: proposals, reports, brochures, even the Moniteur and the Bulletin of the laws. The greater part of my colleagues of the left and the extreme left were in the same perplexity of spirit, in the same ignorance of the daily facts. The national workshops were spoken of only with a kind of fright; for fear of the people is the defect of all those who belong to authority; the people, as concerns power, is the enemy. Proudhon, like the Communists, fights against egoism. Therefore they are continuations and consistent carryings-out of the Christian principle, the principle of love, of sacrifice for something general, something alien. They complete in property, only what has long been extant as a matter of fact — namely, the propertylessness of the individual. … In this too Proudhon is like the Christians, that he ascribes to God that which he denies to men. He names him the Proprietaire of the earth. Herewith he proves that he cannot think away the proprietor as such; he comes to a proprietor at last, but removes him to the other world. 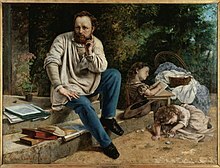 Proudhon was the first to draw attention to the fact that the sum of the wages of the individual workers, even if each individual labour be paid for completely, does not pay for the collective power objectified in its product, that therefore the worker is not paid as a part of the collective labour power. We can find the origins of the doctrine of surplus value, that grand "scientific discovery" of which our marxists are so proud, in the writings of Proudhon. It was thanks to him that Marx became acquainted with that theory to which he added modifications through his later study of the English socialists Bray and Thompson.